A 6 hour flight from Los Angeles may seem less than desirable at first, but the beauty of this island nestled in the heart of the Pacific Ocean will quickly change your mind. From the endless picturesque beaches to the awe-inspiring waves of the North Shore, Oahu is full of endless activities that will make you never want to leave. While the state of Hawaii is made up of 8 islands, each offering their own unique charm, Oahu is the most visited out of all of them, and there’s definitely a reason why. Make the most out of your next vacation to the island paradise of Oahu with these can’t-miss adventures. For a less physically rigorous adventure, take a car and drive up to Tantalus Lookout, only 4 miles north of Waikiki. Here, you will get some of the greatest views of downtown Honolulu and Diamond Head, and if you can find the hidden treehouse make sure to bring along a hammock so you can chill between the trees. Even better, take a picnic and relax on the lush mountain while watching the sunset beyond the city. For a more challenging hike, head to Koko Head Park to take on the 1,048 steps that will have you dripping sweat and your legs feeling sore for days after. What once was a railway built during World War II is now a popular spot for active visitors looking to get in a workout with a view. It is definitely a good idea to wear grippy shoes when hiking Koko Head as the stairs can be quite slippery, especially on the way back down. About halfway up there is a section where the stairs detach from the ground, and looking beneath may be daunting for those fearful of heights. However, while there are many regulars looking to beat their best times, there are some detours that make this hike suitable for less experienced hikers. After the final steps you can enjoy an incredible panoramic view of Hanauma Bay and the residential neighborhood of Hawaii Kai. A shorter journey through the jungles not far from Waikiki brings you to the true beauty of Manoa Falls. This spot is frequented by locals and tourists, and even made an appearance on the TV show Lost and Jurassic Park. The flora is unlike anything you’ve ever seen, and while you may not be sweating by the time you reach the waterfall, you’ll definitely want to take a dip in its cool water. Further along the coast is Laniakea Beach where you can spot sea turtles both in the water and sunbathing on the sand. 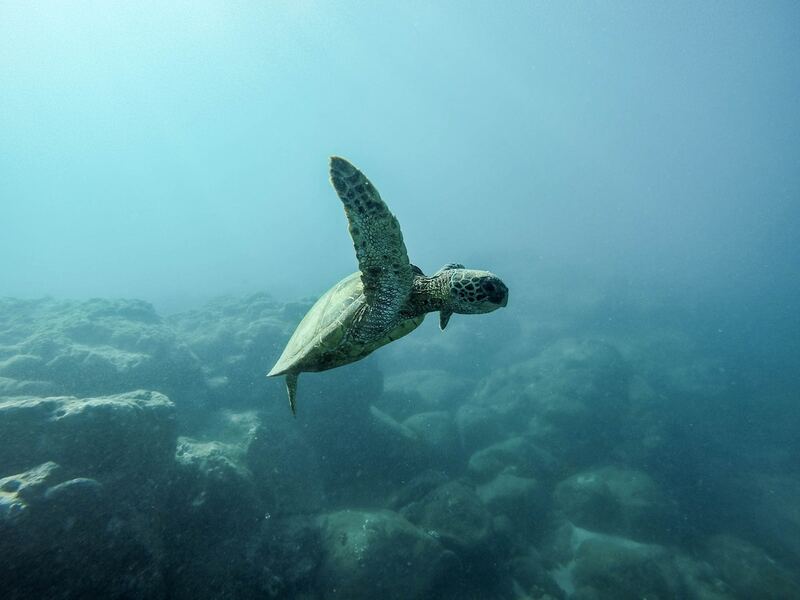 Don’t get too eager though, this endangered species are highly protected by numerous Honu Guardian volunteers who make sure to keep you at a fair distance, but not far enough to snag a picture! If you’re looking for a secluded beach to get away from the crowds of Waikiki, look no further than Cockroach Cove. Lying right next to Halona Blowhole is a cute little beach surrounded by rock formations. It is right off of the Kalaniana’ole Highway and next to the more frequented Sandy Beach Park, so if you want to enjoy a chill afternoon post surfing Sandy Beach’s powerful waves, this is the place for you. On the east side of the island there is a picturesque setting called Laie Beach Park, better known as Pounder’s Beach. Year round waves and white sand make this beach ideal for a peaceful picnic, a quick swim, or any water sports/activities that intrigue you. Many know this beach for the trampoline that sits above the shallow waters which has continuously been taken down by the state, much to the disappointment by risk taking visitors. Most people wouldn’t wake up at 4am for just any reason, but to watch the sunrise from Lanikai Pillboxes is one of the best. This hike is relatively short, taking about 30-40 minutes to reach the final pillbox. From there you can relax as you watch the sun rise on the horizon between the Mokulua Islands (Mokes). As it gets brighter you can take in the beauty of Lanikai Beach, the suburban homes of Kailua, and the Ko’olau Range behind you. The adrenaline junkies who approach this hike do so with caution, and a lot of research. 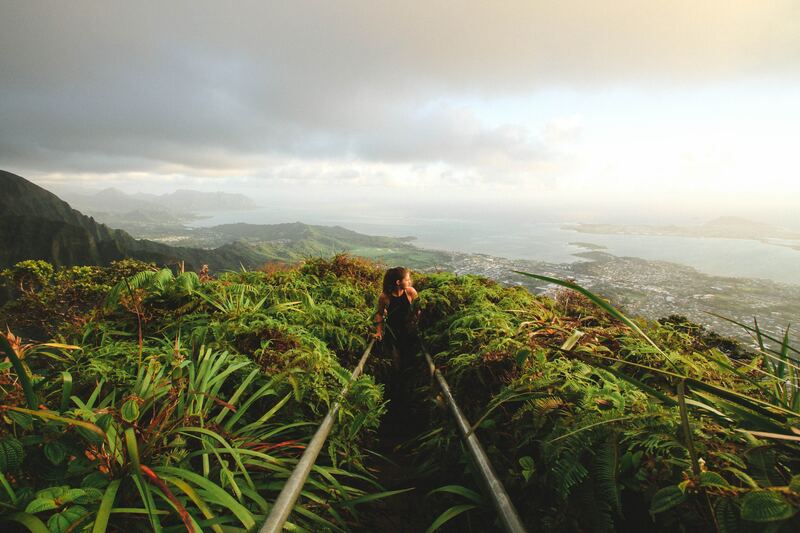 The infamous Haiku Stairs hike, also known as the Stairway to Heaven has been illegal since 1987 due to the partially destroyed sections of the 3,922 stair path. While getting caught trying to enter from the front route will bring you a hefty fine of $1,000, the longer back route poses much less risk. This hike is geared towards more advanced hikers, and those who take it on should definitely be wary of weather conditions. The legal approach would be to follow the 4 hour Kaulana’ahane trail. While it may take a large chunk of your day, it is worth it when you finally reach the top of the ridge, leading you to the top of the Haiku Stairs and presenting you with incomparable views of the valley beneath the wispy clouds that hover the mountain ridge. Hidden beneath another popular tourist destination is an off the beaten path, magical attraction. The Makapu’u Lighthouse Trail, a 2 mile gradual path alongside the Kaiwi State Scenic Shoreline on the eastern tip of Oahu, is paved and moderately easy. What goes unnoticed, however, is the steep and dangerous trail behind the whale watching sign that leads down to the Makapu’u Tide Pools, not for the faint hearted. Before approaching this venture, you should be aware that the state has warned the public not to go unless the seas are calm and the surrounding rocks are dry. While it is not advised, that has not stopped thrill seekers from heading down to experience them. It may seem like you are heading down an incorrect path at first, but you will start to see white arrows painted on the rocks which are meant to guide you as you scramble down the loose gravel. You will feel accomplished once you reach the crystal blue pools, but to prepare for this adventure you should be sure to educate yourself prior about the dangers, wear proper shoes, and climb slowly! Next to the Makapu’u Lighthouse Trail is another tiny cove that lures in a lot of visitors because of the lava rock formation that overlooks the ocean called Pele’s Chair. If you’re into cliff jumping this is one of the safer areas to do so, and there is also an old telephone pole which acts as a makeshift diving platform. 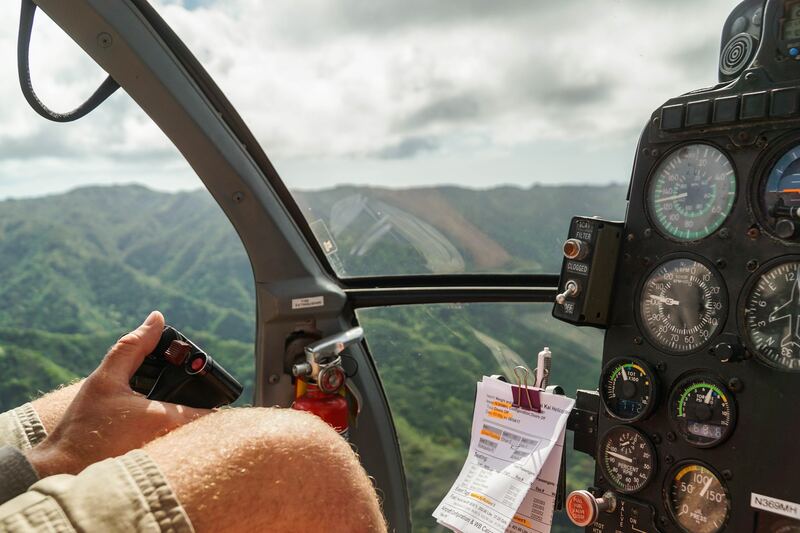 If you’re running low on time but are eager to see everything you can, nothing will provide better views than a helicopter ride over Oahu’s surreal scenery. There are many places for you to choose from that will fly you past the incredible, lush, mountain ranges from the Nuuanu Rainforest, to the North Shore, to Diamond Head and Pearl Harbor. To get an even more thrilling adventure you can head to Mauna Loa Helicopters to board a doors off helicopter for unobstructed and epic views. This is the most popular hike on the island, but there’s a reason why. Diamond Head Trail is only 1.6 miles, but the breathtaking 360 degree views of Waikiki from the old war bunkers at the peak are unmatched. This beginner hike is popular with locals and tourists, and is perfect for adventurers of any age or experience. 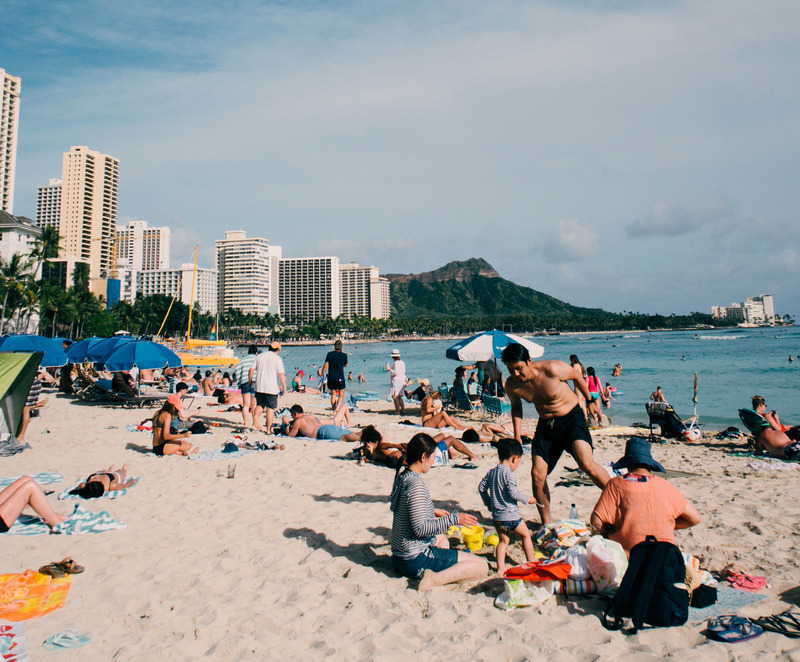 Even though Waikiki is one of the most famous and touristy beaches, it is definitely something that everyone should be checking off their bucket list. Walk along the beach and see the hotel zone, take a class or rent a surfboard and ride the waves along with many other novices and veterans, or jump on a catamaran for a sunset booze cruise along the coastline. There is no shortage of energy at this beautiful and busy hotspot. After all of your crazy adventures on the island there is no better way to end the week than by grabbing a spot on the beach and getting cozy before viewing the firework show which is held every Friday at 7:45 from the Hilton Hawaiian Village in Waikiki.